The 2015 Ford F-150 is one of Truck Yeah! 's most anticipated debut scheduled for the Detroit Auto Show next week. Here's everything we know about it before the cover finally comes off on January 13. Ford's F-Series has been the best selling vehicle in America for 32 different years since it's introduction. Frustratingly, Ford doesn't usually discriminate between the F-150, 250, and 350 to give us that statistic but it's still safe to call the F-150 a damn popular pickup. That gives Ford the challenge of retaining a large existing fanbase while innovating past competitors and bringing in a new crop of customers. Specifically, on the morning of January 13th. There's been much discussion over Ford's partnership with Alcoa Aluminum to build a lighter F-150. While there will obviously be fluctuation in weight across the different cabs, engines, and trim levels, it seems that a diet of about "700 pounds" off the outgoing model is the goal. There will be a range of engines, with talk of a 5.0 V8, 3.5 V6 EcoBoost, 3.0 naturally aspirated and even a 2.7 EcoBoost circulating. PickupTrucks.com spotted what they're sure was a 2015 F-150 prototype leaving GM's facility in Milford, Michigan back in September. I doubt they were lost, and it's been known for some time that Ford and GM are moving toward interchangeability of some key components. We almost definitely won't see it at Detroit, but the Raptor has been a huge hit and a halo vehicle for the truck brands. This is just plain common sense. 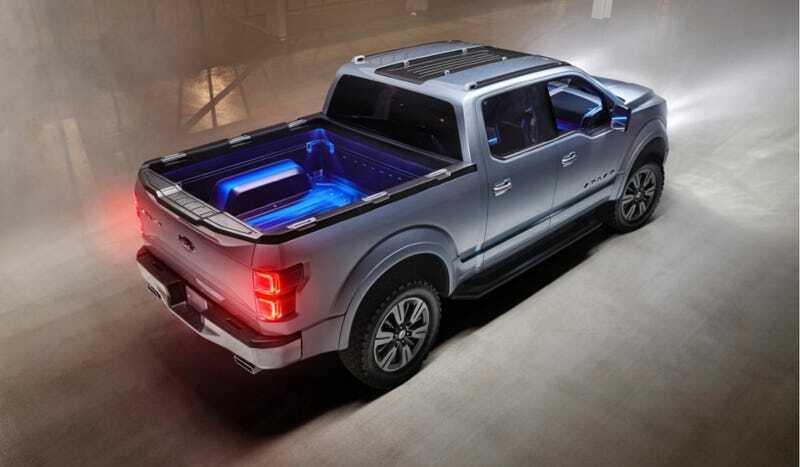 As Jason showed us almost a year ago, the Atlas Concept retained all the F-150's styling cues with influence from more extreme experimental designs. Apparently Ford Design Head J Mays' keyword here is "intelligent." Dynamic spoilers that adjust with speed and vehicle temperature to maximize aerodynamics were part of that concept design, and even the wheels had flaps to cut down on drag — though it isn't clear if those make the final cut. Bloomberg speculated that a 10-speed transmission jointly developed by Ford and GM could be part of the 2015 F-150's efficiency-improving efforts, and forum chatter seems to agree. In December of 2012, the Detroit Free Press reported Ford would spend some $75 million increasing capacity to supply transmissions for F-Series and Ranger pickups as part of a larger campaign to amplify production. When the Examiner reported that Ford and Toyota were abandoning collaboration on a hybrid powertrain last summer, they went on to say that Ford would independently build a rear-wheel drive hybrid setup for use in the 2015 F-150. Not too many people seem to be agreeing, but it's worth keeping an eye open for. There's no one saying this is happening, but the fun thing to speculate now when anyone mentions a new Ford is that it'll get the 1.0-liter EcoBoost three-banger.